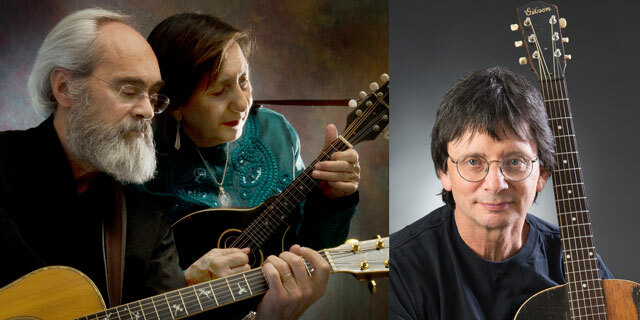 Award-winning performers Rolly Brown and Magpie return to the Rose Garden Coffeehouse, Mansfield, Mass., for a split bill of contemporary and traditional folk, sterling instrumentals and powerful vocals and harmonies on Saturday, April 16. Doors open at 7:30 for the 8 p.m. show. Tickets are $16 in advance at www.rosegardenfolk.com or $18 at the door. A lifelong student of the guitar, Rolly Brown is known to many in the region who have attended SAMW, the Summer Acoustic Music Week, sponsored by WUMB radio, where he teaches guitar. Brown has been a National Fingerpicking Champion (1980), a Philadelphia Music Award nominee, a solo performer, teacher and sideman for many well-known artists. In addition to several solo CDs, Rolly has 11 instructional DVD’s available through Stefan Grossman’s Guitar Workshop at guitarvideos.com, and many performance and teaching videos viewable on YouTube. The dynamic award-winning folk duo of Magpie (Terry Leonino and Greg Artzner) have been stalwarts on the folk music scene for more than four decades. Since getting their start in Kent, Ohio in 1973, they have traveled the globe bringing their unique sound and breathtaking versatility to audiences everywhere. From traditional songs to vintage blues, swing and country, to folk classics to contemporary and stirring original compositions, this New York-based couple covers a lot of musical ground. 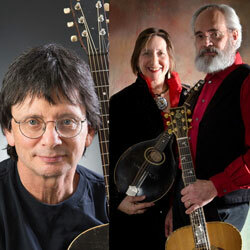 With their powerful voices and harmonies and their excellent instrumental arrangements on guitars, mandolin, harmonica, dulcimer, and concertina, their sound is much bigger than just two people. They are more than just recording artists and songwriters. They are musical historians and social activists who entertain but also inform. Doors open for the 8 p.m. show at 7:30 p.m. Advance sale tickets are recommended and may be purchased at www.rosegardenfolk.com. Tickets are also available at the door. The Rose Garden’s all-volunteer staff serves pay-what-you-want home-baked dessert items and hot and cold drinks before the show and during intermission. The Rose Garden Coffeehouse, is a 501(c)(3) not-for-profit organization in its 27th season of continuous operation. It is located at The Congregational Church of Mansfield, 17 West St., and is wheelchair accessible and alcohol-free.